time to celebrate~ - A mummy's inane blabberings.. I went as a cowgirl (how original right :P)..was shopping around and found this gorgeous brown skirt and lacey top and thought it was the perfect attire for me. Loved the straw cowboy hat too because of its material (not the usual suede type) coz I can also wear it to the beach. Paired it all with a brown pair of boots ( ikepod - I got it from River Island hor - NOT CHEAP!!) My colleagues were saying that I look so much younger in the outfit and I can't help but agree. Look like little girl leh :P And everyone looked so cool in their outfits..Most of us were either cowboy/girls or Red Indians! PBP stands for Product Branding & Promotion. Huey Jiuan, who I've been working with closely together all these years is next to be on my left and Ruth is on my right. That's Ching right in front. Ruth & Ching are in the branding team. With Danny (next to me), Ruth, Ching, April, Willy and Kin! Niccolle (in the middle) is a new addition to our team..
She used to be in display sales and transferred over to join us after Grace left. Leslie Fong, our EVP in Marketing (our big big big boss) - probably the only time we'll get to see him in jeans at work. Yeah, there's a rule set by him, that marketing folks aren't allowed to wear jeans in office which explains the copy..
'Notorious outlaw for the past 21 years. Thousands of slaves have suffered. No less than 100 have died in his cruel hands.Secret weapon - Nagging!" Zoro was there that night..
Manoj the indian chief looking very fierce..
And a mechanical bull for the daring. I only lasted 14 seconds hehe.. The best dressed group contest ended up being a 'highest entertainment value' contest. Our creative folks from PBP really went all out and impressed the judges winning us the title! Most of the costumes & props were hand-made! Really impressive! Check out their winning performance..
With the belle of the night!! Miss Dollah! Chio bus, Michelle & Dannie! With Georgina & Tom..they both received the 10 years service award that night. The end of the year is drawing near soon! It has been quite a year I must say especially with me having to go to the hospital so many times! I just hope next year would be a peaceful one for us and that my family and loved ones to be healthy and happy! Yes, Aidan drew and colored this :) Can you make out who is behind Spidey? *awwwwwwwwwwwwwwwwwwwwwwww to aidan's drawings! * SO cute. 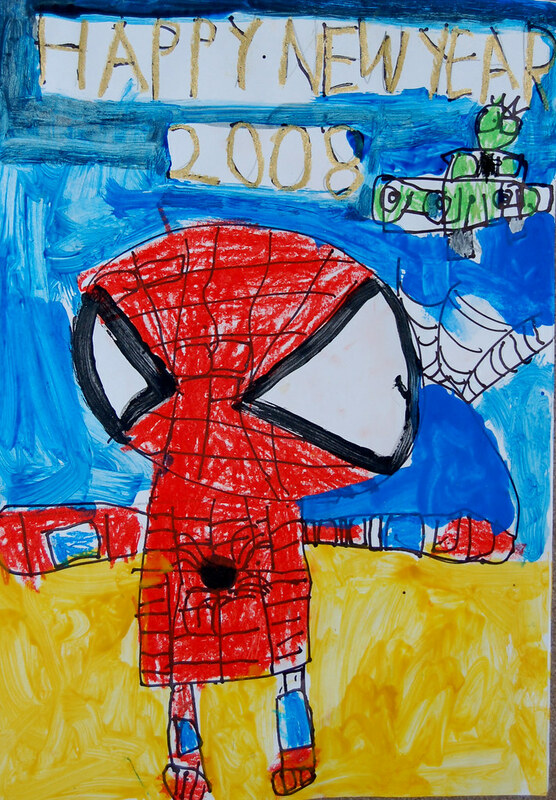 Aidan's painting is so cute that spiderman!!! well done :) but who is that green alien guy in the car??? incredible hawk? is that the goblin guy? his spiderman is so cute though! happy 2008! yeah, our marketing party is usually quite fun and everyone's always so sporting! Have a blessed and peaceful new year too! Green Goblin? 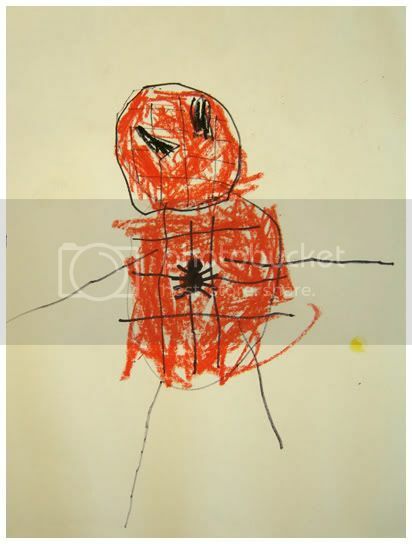 Aidan drew spidey before right? He's getting better! eh i thot it was a green van or something.. haha..
but spidey (2007) version is good! Pwoar! Miss Dollah is so hawt and muscular. Is that you behind aidan's spidey drawing? Here's wishing you and your family a great year ahead! May all goes well in all aspect of your life. alamak..do i look like that *grin*? It is supposed to be green goblin! Happy New Year too and wishing you a great year ahead! Things will definitely look up for you soon!! Thanks! And all the best to you and your loved ones in 2008! WOW... you guys are really sporting! looks like a very fun party! well, at least the costumes were 'easier' to achieve..initially, they'd suggested bollywood theme and everyone balked!